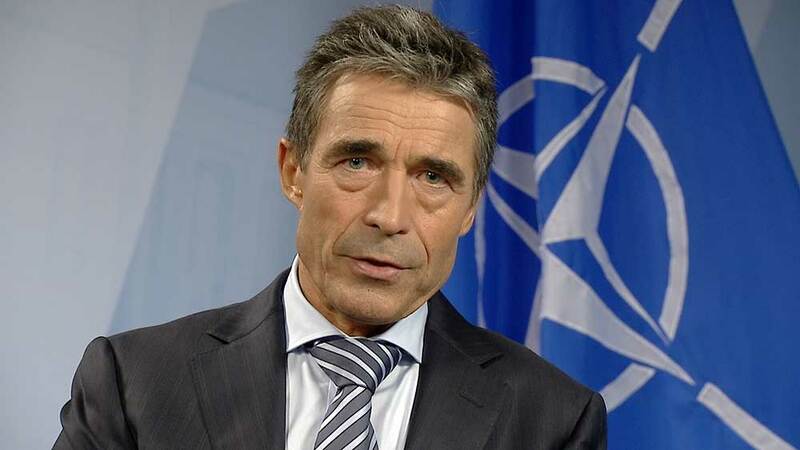 Anders Fogh Rasmussen is Secretary General of North Atlantic Treaty Organization (NATO). He is the former Prime Minister of Denmark. So I thought we could start with a little bit of history about NATO. From your perspective, what you would highlight as some of the most important historical achievements of the alliance? I think that the great achievement is the fact that NATO prevented the Cold War from getting hard. And after the end of the Cold War, NATO constituted the framework for transition in Europe. We have given access to former communist dictatorships, and today they are highly valued allies within NATO. I think these are the great achievements of NATO during our more than fifty years of history. And certainly you mentioned the Cold War, but what continues to draw countries to want to become part of the alliance today? Because it is a good deal to be member of NATO, politically as well as militarily. Politically, because NATO constitutes the only organized framework for a transatlantic political dialogue between countries in Europe, and the United States and Canada in North America. And militarily because within the alliance, we can do much more together than individual allies could do on their own. You get good value and security for your money when you go for a multinational cooperation on defense, and that is actually the essence or being a member of NATO. Well, we have clearly stated that our door remains open to European democracies that fulfill the necessary criteria. And that is that they can contribute to Europe-Atlantic security, and that they are in a position to further the principles upon which our alliance is based. So our goal remains open, but at this moment we have not made new decisions about whom and when we will give access to our alliance. And if I could just jump to Afghanistan, I know that’s something you’ve been dealing with a lot. And I wondered if you could talk a little bit about some of the lessons learned over the past decades? First, on the lessons learned, I think there are two very important lessons learned from our operations in Afghanistan. Firstly, how important it is to engage with partners. In Afghanistan, we have a NATO led ISAF (International Security Assistance Force) mission, which counts fifty nations; that’s the largest military coalition in recent history and all our partners contribute to our operations in a very valuable way. So I think that’s one of the lessons learned, that we need partnerships to accomplish security missions nowadays. Second lesson learned, is that in future operations we should establish training missions at a much early stage than we did in Afghanistan, with the aim to hand over responsibility for security to local security forces. Politically, it’s much better to give the defense of a specific country a local face than to deploy foreign troops for a very long time. And economically, it’s also less expensive to train and educate local security forces to conduct combat operations than to deploy foreign troops. So partnerships and training activities are the two main lessons learned from Afghanistan. What about the credibility of NATO ten year after Afghanistan experience? Do you think it’s been hurt? No. On the contrary, I think we have succeeded in what we laid out as the goal right from the outset. The reason why we are in Afghanistan is that we want to prevent the country from once again becoming a safe haven for terrorists who could use that safe haven as a launching pad for terrorist attacks against United States or Europe. And since the international operations in Afghanistan started, we have clearly seen that Afghanistan is not a safe haven for terrorists. Furthermore, we have seen clear progress in regards to development of the Afghan society. Afghanistan has experienced a relatively strong economic growth. We have seen improvements of the educational systems. We have seen improvements of the health care in Afghanistan. That’s not why we are in Afghanistan; but if we are to ensure long-term peace and stability in Afghanistan, we also need to see improved governments and in that prospect we have also seen steady progress. In your mind, was Libya a success? If so, why? The Libya operation was a great success and indeed a historic event. The United Nations Security Council adopted a resolution based on the principle of “Responsibility to Protect;” protect the civilian population in Libya against attacks from their own government. NATO allies decided that the best way they could implement this U.N. security resolution would be to do it through NATO. So, NATO took full responsibility for the operation and we prevented a massacre on the Libyan people, and it was a precision campaign without president. Thanks to military equipment, we minimized collateral damage; we did all we could to avoid civilian casualties, so it was indeed a great success. And do you think, if called upon again by the United Nations Security Council, that NATO could replicate that experience in another country? Well that, of course, will very much depend on the twenty-eight NATO allies. Decisions on operations are taking by consensus in the NATO council, so all twenty-eight nations must be in agreement that NATO can take on such an operation; but obviously I would not exclude the possibility that all members of the United Nations are obliged to do what they can to implement a U.N. security council resolutions and if the twenty-eight allies decide that the best way they can implement such resolutions is to do it through NATO; then, of course, NATO can take on such an operation, and we do have the right capabilities to do that. Could NATO eventually become the enforcement arm of the emerging “Responsibility to Protect” doctrine that the United Nations? That, of course, very much depends on the position of the twenty-eight allies. They have to be in agreement — all of them — because consensus is needed if we are to take on responsibility for such operation; but in principle I will not exclude the possibility that because we have adopted a new strategic concept, and in that concept we have clearly stated that we adhere to the basic principles of the United Nations charter, of course that also includes an obligation to do what we can to implement a United Nations Security Council resolution. Again, it is for the individual allies to decide whether they will use NATO to implement security council resolutions, or they will take other measures. I know a lot of Americans see the headlines on Afghanistan and Libya, but they’re not really familiar with some of the other operations that are always taking place in different parts of the world. What are some of your current priorities at the moment? Well, obviously our operation in Afghanistan is our major mission, but we have other ongoing operations. One of them is in the Balkans in Kosovo, and since 1999 NATO has been engaged in the Balkans with great success. We have been the guarantor of peace and stability in that part of Europe, so that’s one mission. We have an ongoing counter-piracy mission along the coast of Somalia, and we have a counter-terrorism operation in the Mediterranean, so NATO is still very busy. How would you explain the relationship between NATO and Russia? Well, from an overall perspective, we have improved the relationship between Russia and NATO. Two years ago at our summit in Lisbon, Russia and NATO decided that it is our intention to develop a true strategic partnership; that partnership has not yet reached its full potential. I would say that our cooperation with Russia is following two tracks. One is missile defense; but another track is a number of practical cooperation areas. We cooperate on Afghanistan. We cooperate on counter-narcotics, counter-terrorism, counter-piracy. And in all these areas, we have seen steady progress in our cooperation with Russia. On the other track, missile defense, we have not yet seen significant progress; but our dialogue with Russia continuous because it’s my firm believe that it would be to the benefit of both the Russian people and people of the NATO countries, if we could cooperate on missile defense with the aim to protect our populations against a growing missile threat. How do you see a way out of the European debt crisis? Is the answers smart defense? If so, how are European governments responding to that? Smart defense is definitely one of the answers. Smart defense is about spending our defense money in a smarter way. And the smarter way is to do it through multinational cooperation instead of going for purely national solutions. If we help each other, individual nations can acquire even expensive military equipment that they could otherwise not purchase. So we need more multinational cooperation under the headline of smart defense, and that is of course one of the answers. But having said that, there’s also a lower limit as to how little nations can spend on defense and security; if we are to address the emerging security challenges effectively and appropriately. My last question has to do with the U.S. defense posture and this so-called “pivot to Asia.” I’m wondering how that’s going to impact U.S. relations with NATO and if you all feel threatened by that in any way? On the contrary, I consider the American so called “pivot to Asia” as a positive thing that is also in the interest of European allies taking into account the rise of the emerging power in Asia. It’s quite natural that the United States engage in the Asia-Pacific region. The main point is that engagement in the Asia-Pacific region will not take place of the transatlantic corporation. On the contrary, we have seen the United States take initiatives that are a clear testament to the commitment to European security. One of these steps is missile defense. We have decided to build a NATO missile defense system to protect our populations against a growing missile threat, and a very substantial input into that missile defense system is the American missile defense system. So that’s really a demonstration of a clear American commitment to Europe, and the United States has also announced other initiatives that stress they’re commitment to the transatlantic cooperation and European security.